The rulers of the two most powerful authoritarian regimes in the Middle East are launching major wars to reconfigure the Middle East. Israeli Prime Minister Netanyahu has declared war by proxy on Iran, announcing full-scale military mobilization within Israel (July 27 -29) and organizing the biggest political campaign of ultra Zionist Jews in Washington. The purpose of this two-pronged propaganda blitz is to defeat the recently signed US-Iranian agreement and start another major Middle East war. Ultimately, Netanyahu intends to take care of his ‘Palestinian Problem’ for good: complete the conquest and occupation of Palestine and expelling the Palestinian people from their homeland – the single most important foreign policy and domestic goal of the Jewish state. In order to do this, Israeli leaders have had to systematically campaign for the destruction of the Palestinians regional supporters and sympathizers – Iraq, Libya, Syria, Lebanon and Iran. At the same time, Turkish President Erodoğan has launched a major war against the Kurdish people and their aspirations for a Kurdish state. This has followed closely on several recent incidents beginning with the bombing (with cooperation from Turkish intelligence ) of a Kurdish youth camp, killing and wounding scores of young secular activists. Within days of the massacre of Turkish-Kurdish youth, Erodoğan ordered his air force to bomb and strafe Kurdish bases within the sovereign territories of Iraq and Syria and Turkish security police have assaulted and arrested thousands of Kurdish nationalists and Turkish leftist sympathizers throughout the country. This has all occurred with the support of the US and NATO who provide cover for Erodoğan’s plans to seize Syrian territory, displace Kurdish civilians and fighters and colonize the northern border of Syria – under the pretext of needing a ‘buffer zone’ to protect Turkish sovereignty. Such a massive land grab of hundreds of square kilometers will end the long standing support and interaction among Syrian, Iraqi and Turkish Kurdish populations who have been among the most effective opponents of radical Islamist groups. At the highest levels of US Executive decision-making top Zionist officials avoid association with AIPAC’s public polemics and thuggish bluster, all the while promoting their own political-military ‘final solution’ …for eliminating Iran as an adversary to Israeli-Jewish supremacy in the Middle East. In the State Department and Departments of Commerce, Defense and Treasury, US-Israeli agents acting as specialMiddle East advisers, ambassadors and insiders push Netanyahu’s policies to undermine any normalization of relations between the US and Iran. A recent proposal written by Professor Phillip Zelikow in the Financial Times(7/23/15, p. 9 ) entitled “To Balance (sic) the Nuclear Deal, Defeat ISIS and Confront Iran” is chilling. Zelikow’s role is far more discrete and important to Israel over the long haulthan the loudmouths and thugs of AIPAC and other Zionist fronts. On the surface he pursues his academic and university administrative career (an excellent cover) while repeatedly inserting himself into crucial public discussions and quietly assuming strategic positions to advise on events or policies which have ‘turning point’consequences and where his deep ties to Israel are never discussed. Erodoğan expands ‘Turkoman frontier’ into Syria and Iraq – despite the fact that Turkey has never shown any interest in the Turkoman minorities. To that end, he allies with ISIS terrorists to uproot Kurds, everywhere extending into Turkey. 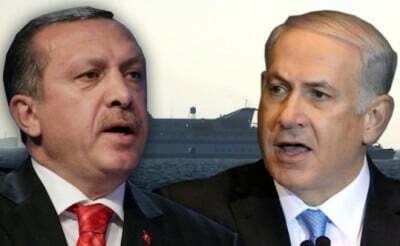 Erodoğan, like, Netanyahu, wants a ‘pure’ ethnic state – one Jewish, the other Turkish! Both leaders have no regard for the sovereignty of neighboring states, let alone the security of their civilian populations. Both depend on the military support of the US. Both are in the process of igniting wider and more destructive wars in the Middle East. Netanyahu and Erodoğan want to reconfigure the Middle East: Turkey seizes Kurdistan and Syria; Netanyahu expands military dominance in the Persian Gulf through the destruction of Iran. These two leaders appear to hate each other because they are so similar in arrogance and action… But according to Professor Zelikow, the US will step in ‘god-like’ to ‘mediate’ the different power grabs among what he mindlessly refers to as the ‘partners of the coalition’.